I agree that bombers are cheaper than GUNs but.. they also have one less hp and three of those are shields. Not to mention that (k-turn aside) they have a worse dial. 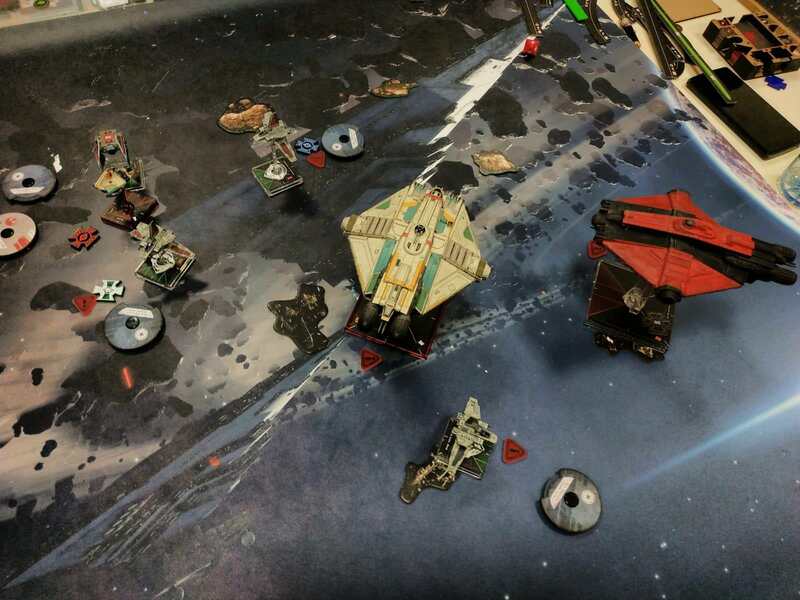 I had a match in which my Rexler Brath remained alone against deathfire, Jonus, redline (at 4hp) and a lambda. And he literally chewed through the bombers and the rest of the squad. No shields=utter danger lol ?? As @ficklegreendice pointed out though, problem is putting some damage through. Missiles are absolutely not comparable to protons at the moment. What would it take (as in what would need to be added/changed) for Lt. Karsabi to become usable again? 1. FAQ the timing of his ability to work with Advanced SLAM. - That would allow him fully modded missile shot sometimes after SLAM or Reload but the cost would be double stress so I doubt it's good enough. 2. The addition of some high attack cannon that could give you 5 dice at range 1. - Something like that would make his ability better than just using the title but based on what they have done with cannons so far it seems unlikely. 3. The addition of a good missile/torpedo that requires you to spend the Lock to fire or get some good extra bonus for spending the lock other than just rerolling (built in focus?) - If it requires you to spend the Lock it wouldn't work with the title but it would work his ability. Anything else anyone can think of? Targeting Synchronizer or any other shenanigans that would allow to ignore TL requirement on ordnance card but not on the OS-1 title. Karsabi has the same issue that Jamming Beam has. They’re both three points over priced. We should start a campaign for Disney to show the Gunboat in some movie (or series - The Mandalorian or the Cassian Andor's would be perfect for this). I'm used to fly a couple of these lads along Rexler, and while I like it I've always had the feeling that once a Gunboat is down, the other becomes much worse due no Ion-stacking and how hard is to turn around sometimes. With that, I've wanted to try to have three, along a really nice blocker with some punch. At the end, 4-1 for a 7th position due some terrible MoV (two of the games were *really* close, including a 65-62 win against a Scum Jank list). Loved it, tho. ^The last game was quite unexpected XD. Not a pleasant sight to have two IN5 (Hera+Swarm) VCX in front, with AP5 feeding them from behind. So much health. Crack shot is primary only, not a great fit for the gunboat. Yeah trick shot and hanging back is probably the best option on them. Bwahaha, we are all stupid. Noone around here realised this, not me, not my rivals, nor anyone watching us playing. Welp, I blame my brain still adjusting from 1.0. Although to be honest it would have been much better with that trickshot (that I had in and switched on the last minute). I think I used CS like only ¿three, maybe four times? or so between all five games, and at least one of those was a range one primary. Maybe I would had a lower MoV with a proper use due taking an extra round to kill certain things, but overall it would've been a similar result. Because 5 is the holy number. Do people really think Gunboats are too expensive? I feel GUNs are fine pointwise but I'm usually wrong with these things. Anyways, two fully kitted rhos with Whisper ( Juke, Afterburners & 7th Sister) is my new favourite list. I feel happy cause I think I finally have figured out how to use slam properly and it is fun! A TIE Bomber often does a similar job, but at 7 points less expensive. So Gunboats need to use their configurations to full effect. OS-1 requires locks at low init, which is awkward, and you'll 'need' Fire Control System, so 10 points more than a Bomber. XG-1 requires investment in a cannon (probably Ion) which brings them up to 40 points--12 more than a Bomber--before adding other munitions. I'm a huge 2e TIE Defender fan. They're the prime example of a Pay-A-Lot---Get-A-Lot ship. But it's really easy to use all the added features of a TIE Defender. The Gunboat is also in the same design style: you'll play a lot baseline, but get a lot of features in SLAMS and Configurations and easier Reloads and shields. But they'll have a harder time to use all those features. Barrage Rocket Scimitar is 34 points, and ready to go. Starwings are certainly cooler and more fun. However, I don't really think the Gunboat needs a price cut. Rather, I think the TIE Bomber (and probably Barrage Rockets) need a price increase. An XG-1 with just Ion cannon is 40, which seems right. Contrast to the Cartel Marauder. Ion vs Regular gun. More shields and total HP, but an odd dial. The two seem decent enough in comparison to each other. TIE Bomber with Barrage Rockets? 6 points cheaper than the Kihraxz. It has better actions (that it can't use while firing Barrage Rockets), and a roughly equivalent dial. That difference in price for capabilities should probably be a little closer. Please stop asking for bombers to get more expensive. For the first time ever they are worth fielding and people are already calling for price hikes on them. Barrage Rockets are not as simple to use as many people are saying. Requiring the focus action every turn really does limit them. Yeah for 34 points I can run 3 different 3 die attack generics for the Empire. Of these, the Bombers are probably the least efficient ones. I wish they had baked something into the Gunboat chassis. It seems silly to have kept Advanced Slam as a mod when something so limited is just screaming to be a K-wing and Gunboat chassis ability. Bombers would still be good at 29 or 30 points. Bombers and TIE Aggressors meet in the middle at 29? Barrage Rockets I could see being 7 points (rather than 6) since they're a lot easier to use than lock-based missiles, particularly on low-init ships. Consider: Concussion and Barrage are the same cost, but Barrage have more charges, potential for both focus and reroll mods, and easier. That seems off in balance, just a little bit. 36 points for a Barrage Rocket Scimitar I think would be about right. E-Wings and Han Solo gunner are probably the only two things in this game I'd adjust by more than 2 points. Concussion missiles are terrible, we should not be trying to move Barrage Rockets (probably the best designed munition in the game) towards the useless Concussions. If anything Concussion Missiles need to drop down to 2-3 points max. Barrage Rockets are strong (doubly so with Jonus), but they do not need a price increase. Keep in mind that at the bigger events we see a lot more bombers running proton torps than we do barrage rockets. Could just as easily have said this. Please stop asking for QUADJUMPERS to get more expensive. For the first time ever they are worth fielding and people are already calling for price hikes on them. TRACTOR BEAMS are not as simple to use as many﻿ ﻿people are saying. Requiring AN ACTION every turn really does limit them. Just Sayin' - Ah good old self interest has a way of tainting our point of view. Darn, you caught me. Logic dictates that if I think one thing is underpriced then I cannot defend another thing that I think is fairly priced.